Which gorgeous Hollywood star did Charlotte Casiraghi meet at the gala? | HELLO! She's the daughter of Princess Caroline of Monaco but Charlotte Casiraghi had the chance to mingle with Hollywood royalty earlier this week. 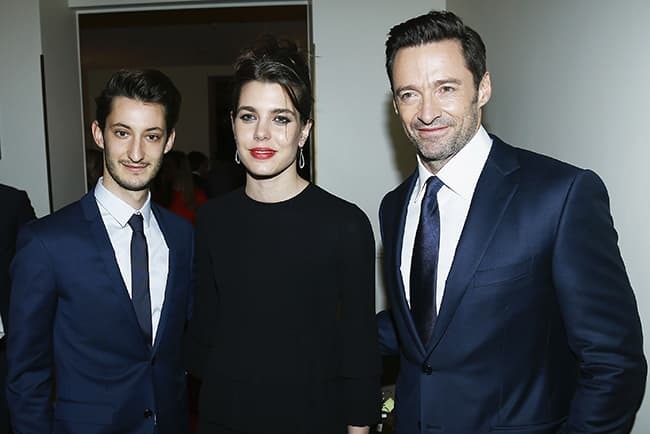 The striking brunette attended a gala dinner in Geneva, Switzerland on Monday night, where she rubbed shoulders with none other than X-Men star Hugh Jackman. Charlotte, who is eight-in-line to the Monegasque throne, opted for a timeless, classic look in a thigh-skimming black dress. She added just a pop of colour with her red lipstick and scooped her hair into a messy bun. The 29-year-old, who is said to be dating Italian film director Lamberto Sanfelice, was attending the Montblanc 4810 Collection Gala Dinner. Charlotte was joined by Hugh, who was showing his support for the luxury goods company as a Montblanc ambassador. The handsome Australian cut a dapper figure in a navy blue suit, crisp white shirt and embroidered maroon tie. The photogenic pair were seen chatting and mingling with other brand ambassadors, including French actor Pierre Niney and Taiwanese actress Gwei Lun Mei. Charlotte's stunning appearance comes amid reports that the mum-of-one has a new man in her life. While the talented showjumper rarely addresses her relationships in public, it is said that Charlotte and her long-term partner Gad Elmaleh have split up. The pair were first linked in 2011 and went on to have a son Raphaël in December 2013. However, Charlotte has recently been spotted with Italian beau Lamberto Sanfelice. The pair were first reported to be dating at the end of last year and earlier this month Charlotte and Lamberto were snapped enjoying a stroll in the romantic city of Rome.